With Apple’s long-awaited iPhone X finally on sale, Apple has released a new video walkthrough of all the major new user interface changes. While we all know by now that a swipe up takes you to the home screen, there are actually quite a number of changes to the way that users will interact with the device. Like the changes iOS 11 brought to the iPad UI, the iPhone X reinvents how you interact with your device so much so that a video walk through is surprisingly essential. If you swipe up from the bottom of the iPhone X, a long pause now brings up the multitasking view. The Control Centre, which includes quick shortcuts to functions like display lighting is now enabled by a swipe down from the right side of the display as it faces you. It is actually now more like the way Android works in this regard. Without a home button, Siri is now enabled manually by what used to be the power button on the right-hand side of the device. To power down the device, the Siri button must now be pressed together in conjunction with either of the volume buttons. The UI changes don’t stop there either. 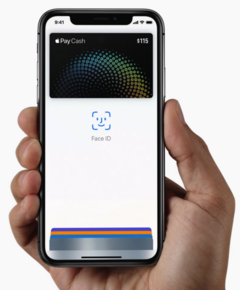 Apple Pay is now enabled by double tapping the “Siri” button on the right-hand side of the device. Without Touch ID, you need to make sure Face ID gets a good look at your face in order to authenticate. You wouldn’t describe any of these changes particularly intuitive (even though Apple does so). There is nothing particularly natural about any of them, other than perhaps the swipe up to go home. After a short learning curve, they will certainly become normal, if not strictly speaking, intuitive.